Keraisureshv Blackberry Blog: Getting start with Blackberry 10 and Tablet development with HTML/WebWorks. Getting start with Blackberry 10 and Tablet development with HTML/WebWorks. 1. What's the WebWorks Application? A Blackberry WebWorks application is simply a standalone web application that you can deploy to a Blackberry smartphone or tablet. 2. Process of creating application. 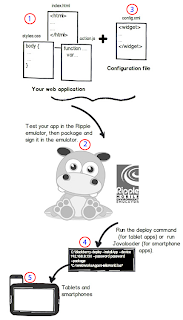 ii) Test and debug your application with the Ripple emulator. iii) Create a WebWorks configuration documents (config.xml) that contains details of your application like App name, App description, icon etc. 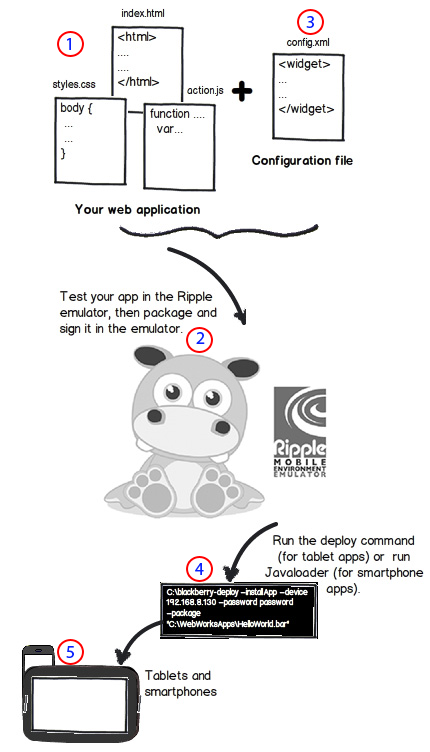 iv) Package you application using the Ripple emulator. v) For Blackberry 10 application or Blackberry tablet application deploy the .bar file to a Blackberry device or simulator. We are go through Blackberry 10 and Tablet development. Download the BlackBerry WebWorks SDK for BlackBerry Tablet OS from the Downloads page. In the folder where you downloaded the BlackBerry WebWorks SDK, double-click the installation file. On the License Agreement screen, accept or decline the terms of the license agreement and click Next. On the Choose Install Folder screen, select a location to install the BlackBerry WebWorks SDK and click Next. On the Choose Adobe AIR SDK Install Folder screen, select the location where the AIR SDK is installed, and click Next. On the Pre-Installation Summary screen, click Install. When the installation completes, click Done to close the installer. Now Install Blackberry webworks install process completed. 4. Download/Install Ripple emulator on windows? Note: Before you install a newer version of the Ripple Emulator, uninstall the previous version. Locate the Ripple installer file that you downloaded to your computer, and run the installer. Review the license agreement, and if you agree to the terms, select the I accept the terms of the License Agreement option and click Next. Specify a location where you want to install the Ripple Emulator, and click Next. Review the pre-installation summary, and then click Install. Click Done when the installation process completes. Configure Ripple Emulator on Chrome Browser if you have not Chrome browser please download it. 1. From the installation folder, click the ripple_ui.crx file and drag it into the browser window. Now Ripple Emulator process completed..